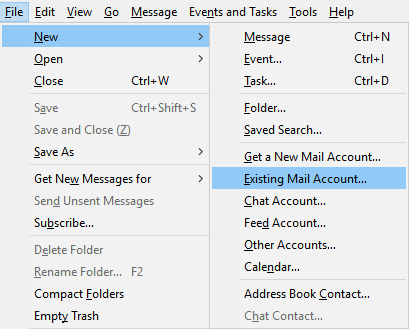 Mozilla Thunderbird is an open source mail client and RSS reader made by the organization who produces the Mozilla Firefox web browser. 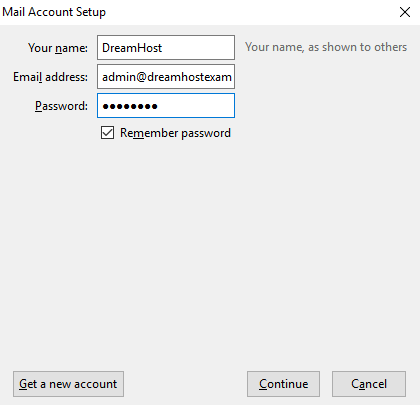 This is a free email client you can use with DreamHost. It can also be used as a backup client for testing purposes if you find your primary client is not functioning as it should. From the File menu, select New and then Existing Account. Your name: Enter the name of the user you’re setting up. This shows in the message ‘From’ details. Email address: Enter the full email address for your user here. Remember password: You can check this box for so that the program doesn't prompt you to enter the password each time you open it up. Once you enter the information above, click Continue on the bottom right. The correct settings for your mail server should appear. Check the 'Mail server names' article to confirm. 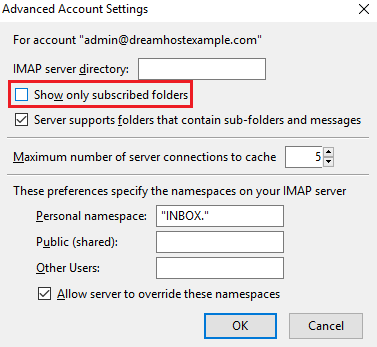 The incoming server should be either imap.dreamhost.com or pop.dreamhost.com. 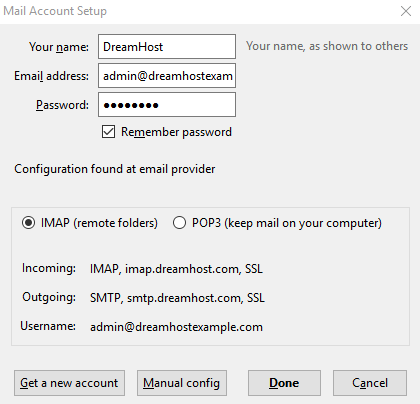 The outgoing server is always smtp.dreamhost.com. Thunderbird automatically configures your address to use secure settings. This means port 993 IMAP and 465 for the outgoing server. To confirm these settings, click your email in the left pane. In the center pane click 'View settings for this account'. A pop-up displays. In the left pane click 'Server Settings' under your address to view the port#, SSL option, and Authentication method. Click 'Outgoing Server Settings' in the left pane to view those settings. The Thunderbird mail program refers to the full message headers of a message as the “source”. In some cases, you may need to retrieve the full header (or “source”) details of a message. Click the message to view its content. In the far right corner of the message, click the 'More' dropdown. In the drop-down options, select 'View Source'. This opens a new window with the full header details of the message you choose. Some of my IMAP folders don't show on Thunderbird. How do I fix this? Make sure that you have subscribed to them! In the pop-out menu and choose 'Subscribe'. The Subscribe box opens which shows you the default folders to which you are already subscribed. 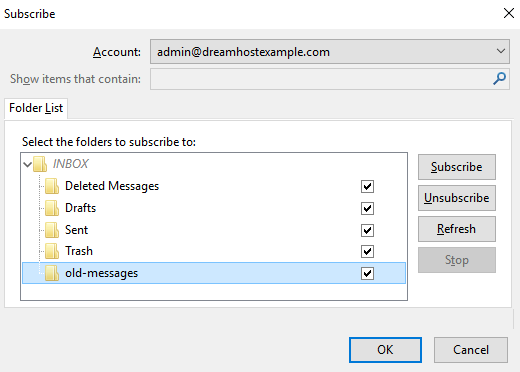 Check the box for the folder you wish to subscribe to, then click the Subscribe button to add that folder as an accessible folder through Thunderbird. Go to (Tools > Account Settings... > Server Settings) then click the Advanced button. Uncheck "Show only subscribed folders". Click OK on that pop-up box. Click OK on the 'Advanced Server Settings' box you originally opened. 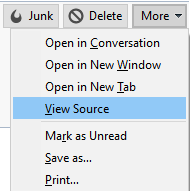 In the left pane of Thunderbird's main window, click the triangle icon to the left of the email address. Collapse and un-collapse the account you edited. This makes Thunderbird re-read all of the folders on that account.